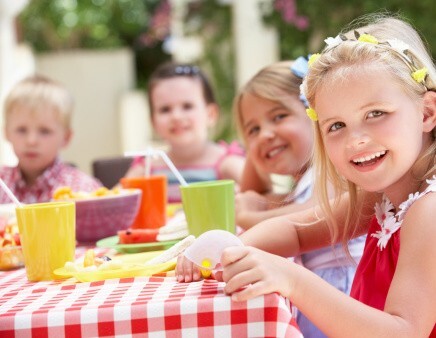 The KinderCare Learning Center in Celebration, Florida is making profound changes to encourage parent involvement and education about nurturing healthy eaters. Center Director, Dawn Dalgleish, tells Let’s Move! Child Care that parents at her center are hungry (no pun intended) for solutions to the challenge of eating healthy into a busy lifestyle, especially considering the limited time many of the parents have. When healthy eating resources, such as handouts, were made available to parents, they were eager to take them home and serve healthy meals. In addition to providing resources and other handouts to parents, the KinderCare Learning Center is changing how special events and celebrations are hosted. In the past, tables were lined up and covered with bright paper, colorful decorations and themed plates, cups and napkins. Parents would bring food for the party and before long, the children’s plates were brimming with cupcakes, cookies and chips. Everyone sat. Some chatted, but most parents were busy serving food and didn’t really interact with each other. Recently, the KinderCare Learning Center decided to take a completely different approach to celebrations. Tables were brought outside. Parents arrived with fruits and vegetables. Instead of focusing on the food, the games began. Parents and children played musical chairs and participated in relay races around the playground. Something wonderful was happening. Families bonded in a way the center had not seen before. In the past, parents spent time preparing food, serving food, cleaning up food. Food, food, food. Unhealthy food. This time they laughed together while trying to grab the last chair. After the events were over, the families enjoyed the fruits and vegetables they had brought and enjoyed themselves in a new way. The Center Director says parents still talk about that event, and the center has decided that it will never go back to the parties with unhealthy food and sedentary activities. There will be an active component to at every event and celebration. » Check out more tips about healthy celebrations. » Read more success stories. Program staff at Angeles Mesa YWCA in Los Angeles was concerned with a number of unhealthy practices at their center. Celebrations were filled with sweets. Children were also not getting enough exercise. Head Teacher, Colleen Rodriguez, decided to lead the center in change. Nibbles for Health was developed by the USDA for child care center staff and parents of young children enrolled in child care centers. Nibbles for Health has reproducible newsletters that staff can give to parents to address many of the challenges they face every day.